It could (and definitely should) be a movement, but more specifically it’s a blog written by my good friend Angel Castillo. Angel has a pretty unique take on dapperness that he was good enough to share with me, and which I’m excited to relate here to The Green Tailor readers. Angel, an American with a Cuban father, works as a post-production manager at a Hollywood studio by day. As if that wasn’t cool (and dapper) enough, by night he’s a stand-up comedian, improviser, writer, pro wrestling commentator…and general entertainer of various stripes. Angel and I become friends through the facebook group Real Mean Real Style, and he featured an interview with me on Dapper and Woke! I then turned the tables on him, and am here relating our email conversation about being, exactly that, dapper and woke. I first asked Angel where his love of dressing sharp came from. I find in many cases that a man’s sense of dress is heavily influenced by his work environment, and the role he plays (or wants to play) in it. Angel explained that prior to his current job, he’d been able to get away easily with wearing t-shirts a lot of the time. This changed when he began working in the Holywood studio, as he became surrounded by executives and managers of varying levels who are, at the very least in oxford button-ups and some shiny leather shoes. In Angel’s words; Initially I was lazy, just switching polo shirts for t-shirts to look a little more professional, but then I decided I really wanted to look like I fit in and deserved to be there. I find this a common theme with men that dress sharp, usually they need to conform to work / social standards, while at the same time (to paraphrase Angel) try to find all the ways one can still express ones personality and set oneself apart. Something that’s hard to explain to someone until they experience it for themselves, is that: It’s paid off. I’ve noticed strangers treat me in general with a more cordial and respectful manner. I, in turn, feel better about myself and tend to conduct myself with more confidence. I realized how dress can be a part of self care. Even outside of work, it helps me set myself apart and establish a brand, if you will. Of course, as I got more into clothes and accessories, I started buying more stuff. At the same time, things have happened in the United States and abroad, like the 2016 election, market crashes, all sorts of events that made me a little disillusioned with corporate capitalism and consumerism. I was trying to reconcile my political beliefs with my newfound “passion for fashion,”. I decided that, while there may be inherently no such thing as “ethical” consumption under capitalism, one CAN decide where to spend one’s money to try and lessen one’s negative impact, like supporting small independent businesses or bigger ones that contribute significant portions of their profits to charities or activist organizations. And thus Dapper and Woke was born, with a a shockingly similar concept behind it all to The Green Tailor. Bless the internet for bringing me and Angel together over our love for ethical fashion on opposite ends of the globe! Now that we have some background on Dapper and Woke and it’s founder, I asked Angel some more in-depth questions. We progressed into a chat about menswear’s conservatism, and how his personal style ties into his ethical objectives. There is definitely a very limited scope of what kind of clothes, accessories, grooming, etc. fit into the common conception of a well-dressed man. 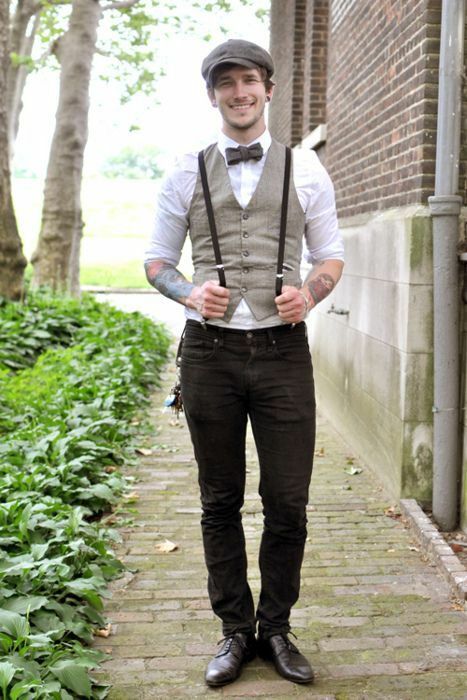 What I find interesting in men’s fashion in the United States right now is a revival of prohibition-era (1920’s/1930’s) styles of dress and grooming, like razor fade haircuts, handlebar mustaches, suspenders, bow ties “newsy” caps, all things that I find personally appealing and have incorporated into my personal style, but, as you say, is not only conservative, but actually reactionary, going back to an idea of how things used to be. I would love for the cultural conception of what makes someone look dapper to broaden out a bit, especially in terms of discarding old conceptions of which clothes are gender-specific. One piece of clothing I’ve always wanted to buy but have never been able to convince myself to go through with is a utilikilt. Maybe if I lived where kilts have cultural presence, people wouldn’t bat an eye, but here, you’d get one of two reactions: 1) he’s wearing a skirt, he’s a cross-dresser, or 2) he’s wearing a skirt, he’s so desperate for attention and for us to know he’s an eccentric. When it comes to supporting ethical brands, Angel tries to take a intersectional approach when looking at companies: i.e. does this company have the goal of empowering a socially marginalized group (sexuality, race, religion, etc), an economically marginalized group (immigrants, ex-convicts, etc), or does it try to remove itself from an economically or environmentally exploitative practice. Concerns like fabric and labor are of course a part of that. To wrap it up, Angel and I went down the dark road of discussing fashion’s place in society. It’s a question I find infinitely interesting, and love hearing diverse views on the industry’s, and even the concept’s, role in our lives. How does this Dapper and Woke gent see it? Fashion is a facet of popular culture with a platform, and I think it absolutely can and should use that platform to affect and reinforce social change. Right now I think it has the most effectiveness in elevating socially marginalized groups and creating opportunities for representation, e.g. more trans models, more models of color, gender-neutral clothing styles, plus-sized clothiers, anything that shows the everyday public that every shape and shade of body deserves to be treated with the same love we give thin, white, cisgendered bodies. Of course, the next level is to bring class and economics into the discussion: making good clothing more affordable and accessible where possible in ways that don’t require exploiting labor or abusing resources… That’s going to be a harder discussion for the fashion industry to have as it’s a more complex solution than just putting out an advertisement with a gay couple on it. Thank you Angel for reaching out to me, and indulging me with such considered and enlightened responses to my questions. I’m really privileged to be friends with you! Now you should definitely shoot over to Angel’s blog Dapper and Woke, and get your mental juices flowing on what your dapper self, and the fashion industry at large, can do for our world.